Admit It! You would love to study at the place where the future King of England fell in love with his lovely Kate and at the place where higher education began in America. Of course I’m talking about the St Andrews William & Mary Joint Degree Programme again. The mere fact that these two universities formed transatlantic ties to create such a unique program illustrates the power of international cooperation; a study in diplomacy, negotiations, and cultural understanding if you will. Without beating a dead analogy too much, let’s take a deeper look at the International Relations Program within the St Andrews W&M Joint Degree Programme. Disclaimer: This blog may sound a bit biased as I did major in International Studies (now called Global Studies) and Government at W&M. Therefore, I do believe our IR curriculum and faculty to be absolutely amazing. That being said, I see such promise and opportunity in this Joint Degree Programme that I will attempt to refrain from singing only the praises of my favorite W&M department and professors. The W&M IR department provides students with an in-depth study of the political, economical, and historical relations between states and non-state actors on the international playing field. Through a well-crafted progression of courses in the study of multistate interactions, W&M IR majors experience a broad social-science-based curriculum via courses in political science, economics, history, and research methods. With the requirement of at least intermediate foreign language proficiency, students employ the knowledge of at least one other language to master this cross-disciplined degree. Outside the classroom, W&M IR majors take advantage of many student organizations, annual global film conferences, and even cultural immersion in our W&M Language Houses. 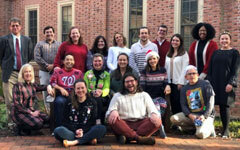 Professors and students work together in an effort to produce relevant research in the evolving world of international relations including co-lead student and faculty projects such as PLAID (Project-Level Aid), TRIP (Teaching, Research, and International Policy) and PIPS (Project on International Peace and Security). The combination of academics, extra-curricular activities and undergraduate research produces graduates capable of analyzing the complex and evolving relationships between states from a varied and practical background. St Andrews offers the only School of International Relations in Scotland and is arguably one of the best in the English-speaking world. The school focuses on three main areas of international relations theory: 1) conflict, peace and security 2) global and regional international institutions and 3) the impact of international relations on civil groups and vice versa. The St Andrews’ curriculum centers around the diverse realm of international relations theories, not only presenting the theories for analysis, but encouraging students to approach commonly held assumptions with a critical eye. The School offers varied and interesting research opportunities for students including a one of a kind survey tool for youth political trends in Europe (European Survey of Youth Mobilization). This emphasis on theory and philosophy rather than social science applications prepares students to understand interactions between states (past and present) from varied theoretical and historical sources. While the St Andrews W&M Joint Degree Programme might appear like a 2.0 version of a junior year abroad, the International Relations Program is a great example of how the institutions’ different yet respected approaches to the same field of study will produce an unparalleled education. Joint Degree students will be able to fully understand the evolution, current situation, and future challenges of international politics as well as master the ability to analyze the many theories behind IR which are not often taught in the American political science classroom. Students will be well versed in both the broad social science foundation to understanding the practical interactions between states as well as the theoretical groundwork for the majority of scholarly international relations literature. This will provide American students with a well focused theoretical basis which is generally only found at the graduate level in the U.S., and will expose UK students to a more hands-on and scientific approach to this common field of study. For all we know, the combined historic powers of both institutions may produce the next game changers in the IR world, or at least very well balanced and culturally aware scholars with roots on both sides of the Atlantic. Now that we’ve discussed the History and IR components of the Joint Degree Programme, tune in next week for the last two installments: English and Economics. Just a word of thanks from one parent whose daughter will be applying for admission to the new Joint Degree Programme. I very much appreciate the clarity and concision of your prose as you offer helpful insight into the new program and its four majors. In a world grown infinitely smaller, it is critical that our daughters and sons become productive citizens of a global community. W&M and Saint Andrews offer a wonderful model for other first-tier universities to consider. Thank you for your comment! I am glad to hear that the blogs are providing some insight into the Joint Degree Programme. We wish your daughter all the luck in the application process. Enjoy the holiday season.